It's that time of year again. Halloween has just past and Christmas is looming on the horizon (and Thanksgiving is just a few days away for my American readers). Don't get me wrong: I love Christmas, but I'm always stitching down to the last minute creating my gifts. To help you avoid this situation, I've included a list of easy projects that are great for giving - and you've still got lots of time to get them done! This is a FREE pattern from Chatterbox Quilts and can be used to create a pincushion, ornament (add a hanging ribbon), shelf sitter or sachet (add your favourite potpourri). If you'd like to have complete instructions on doing the embroidery stitches in this project and see how to create it, just enrol in my Curious class, Hand Embroidery Essentials. Click here for a 20% discount on the course now. Snowflake Brrr! is another frosty seasonal design that makes a quick ornament or is great just placed into an embroidery hoop for a quick and fun wall decoration. You can find this FREE Chatterbox Quilts' pattern on our store. Our Christmas Stitchery Set and Winter Stitchery Set each include three little designs that can be used for a variety of projects. Stitch up all three patterns, add sashing between each of them, border them all and you have the perfect wall hanging. Better yet - buy both sets and then create a small quilt or wall hanging using all six designs. 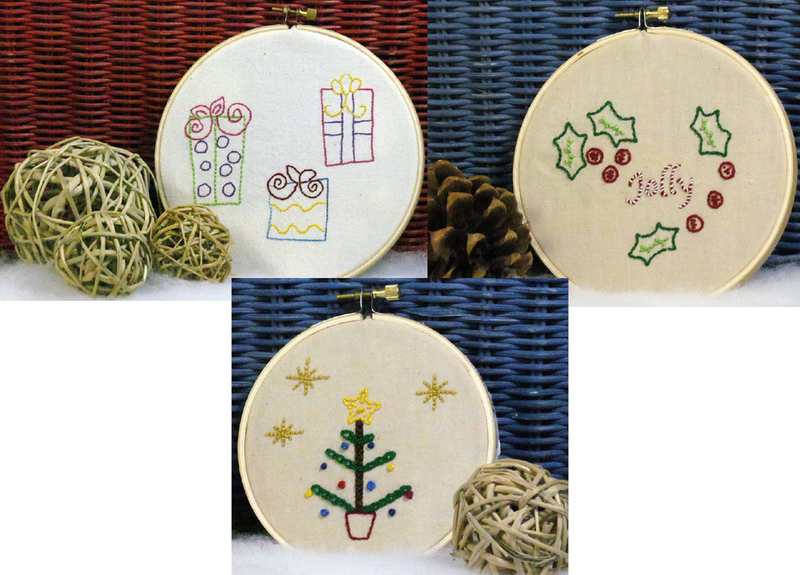 Christmas Stitchery Set by Chatterbox Quilts includes 3 seasonal designs. 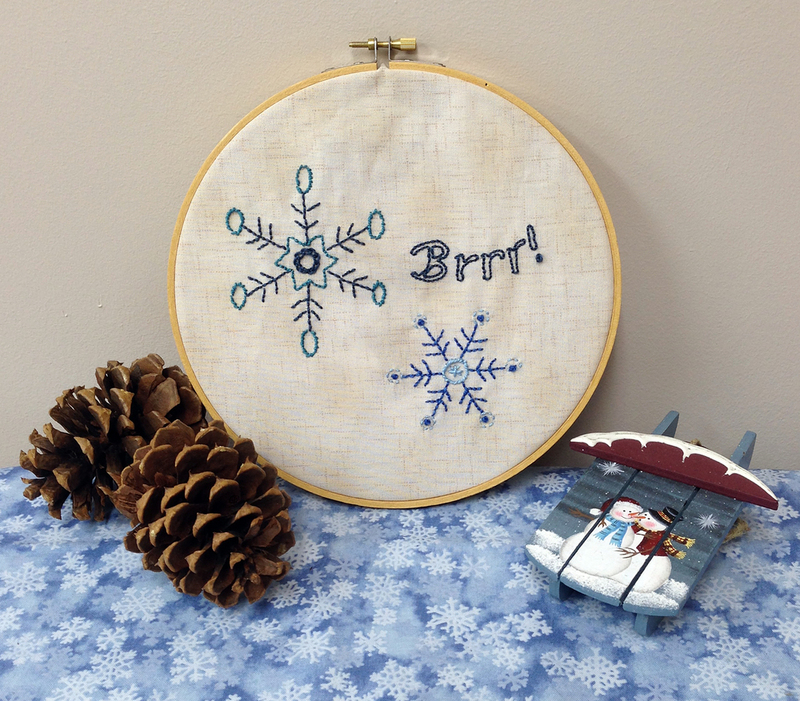 Winter Stitchery Set by Chatterbox Quilts can be made into an ornament or wall hanging. If you need a gift for a little one or baby, Screech, Hoot and Whoobie would be perfect. These little stuffed toys use hand embroidery for embellishment, so there aren't any buttons or pieces that might fall off or be a danger to the under 3 year-old group. I just like them because they make cute shelf sitters in my studio. Hoot (the daddy), Screech (the momma) and Whoobie (the baby) by Chatterbox Quilts are adorable toys or cute shelf sitters. Don't know how to hand embroidery? No problem! Enrol in Hand Embroidery Essentials to learn all about the tools you'll need, thread choices and how to create simple embroidery stitches. 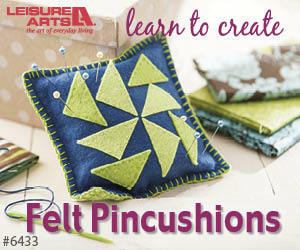 We'll even create the Flourishing Heart pincushion/ornament together. Enrol in Hand Embroidery Essentials to start stitching today. Next time I'll have some quilted project ideas that make great gifts. Welcome to Telecast Thursday. This is the final week for hand embroidery stitches and information. In this week's video I'll show you what I have in my hand embroidery tool kit. I like to keep my items in a small tin or zippered pouch and I have everything in it I need to work on my hand embroidery projects. I hope you've enjoyed this series on hand embroidery and that you'll try out some - or all - of these stitches in a project soon. If you're wondering where to start, I suggest you try my Flourishing Hearts ornament. The pattern is available on my store and it's FREE! I'd love to see what you're creating, so be sure to send photos of your projects to me at kim@chatterboxquilts.com. Subscribe to my Youtube channel to receive automatic notifications when new videos are posted. You can also click on the Chatterbox Quilts logo in the lower right corner on the video itself to subscribe. If you like my videos, please share them with your fellow creatives. Next week I'll be sharing a "new" vintage sewing machine that is now in my stable. Welcome to Telecast Thursday. This week I won't be showing you a new hand embroidery stitch, but don't worry, I'm still keeping with the hand embroidery theme. While it's great to learn all these stitches, you may also want to know what books I have in the embroidery section of my library. This week I'll be sharing with you my "must-have" books for reference and inspiration. If you haven't seen the other episodes in this series, you'll can find them here. Let me know what your favourite embroidery books are.